Increasingly stringent environmental standards for water and wastewater treatment are being introduced in many countries. This is putting growing pressure on the existing facilities that are used to treat potable water and process water, industrial effluent, sewage and the resultant sludge. But what actually happens to water when it is “treated” to various standards, for example for household use or for disposal? As the world’s leading chemical company and as a global leader in solutions for water treatment facilities, BASF has a unique view of what happens behind the scenes. A first stage of water treatment includes using flocculants and coagulants for solid-liquid separation processes, to remove solids from the water. These help to enhance the efficiency of processes such as sedimentation, flotation, thickening and dewatering, in which the treated raw water is clarified for subsequent use. Certain chemicals and processes are needed for sedimentation, flotation, thickening and dewatering. They ensure that the effluent is clear and fit for subsequent discharge or recycling. The reverse osmosis process is used to purify water by membrane filtration and is commonly employed in sectors such as desalination, paper, food, steel, industrial chemicals, pharmaceuticals, automotive and petrochemicals industries. However, scaling and bio-fouling of the membrane can cause expensive downtime or costly repairs. Physical and chemical solutions can help maintain a high permeate flow without risk to the membrane. They prevent scaling and bio-fouling and ensure the continued efficient operation of reverse osmosis units. These include membrane-friendly antiscalents, biocides and cleaning and dispersing products. This is particularly important in process water circuits, industrial boilers, heating systems, cooling systems and reverse osmosis processes. Effective heat transfer in cooling systems is essential. Different cooling systems demand different types of treatment to eliminate scaling, corrosion and bio-fouling. Speciality antiscalents can help maintain proper heat transfer, along with cleaning and dispersing products, corrosion inhibitors and biocide formulations that can be used in all applications under all operating conditions. Preventing Legionella growth is now an established part of every water treatment organization’s legal obligation to manage all risks associated with their operations. Today more than ever, the risk of Legionella in water systems poses a danger to the health of communities and businesses. Because the management of Legionella risk has to follow the same approach to environmental and quality standards as other risk management programs, industries need Legionella professionals to keep their systems Legionella-free. Overall, preventing Legionella includes a risk assessment , training for the water treatment plant work force, Legionella analysis, early detection and speedy intervention, and tailored cleaning solutions, monitoring, and follow-up. Foaming can cause problems in many industrial processes. Although the nature of the problem can vary, the majority of water treatment operations need enhanced foam prevention and control. In order to manage foam while still operating efficiently in the light of greater volume demands, water treatment facilities need higher vessel utilization, more efficient washing processes, faster filtration and separation, cleaner filtrates, more controllable reactions, improved product formation and higher yields. Advanced foam control agents to ensure that the best results are obtained within the context of their specific processes. The latest technologies were developed by applying the insights gained into the very different nature of the foam generated in aerobic treatment, anaerobic digestion, sludge dewatering and in streams of treated effluent discharged from treatment plants. A new technology is ultrafiltration, developed by the German company inge GmbH – widely regarded as the global leader in the field of ultrafiltration technology, now a part of BASF Group. This technology features the highly-efficient and robust ultrafiltration membranes as well as the space-saving rack designs used to treat drinking water, process water, waste water and sea water. The extremely small-pore filters of the membrane reliably intercept not only particles, but also microorganisms such as bacteria and viruses, thereby providing a dependable source of clean water. How much treatment is right? Because treatment processes are becoming increasingly complex, computer-assisted dosage control systems have been introduced. They provide automated control, optimum chemical consumption, improved process reliability and reduced costs. These processes help ensure that all plants and processes that utilize water are able to operate at peak efficiency. BASF is committed to leadership in technological innovation that will increase the efficiency of industrial processes, maintain high standards of pollution control and protect its customers’ investment in the water circuit. 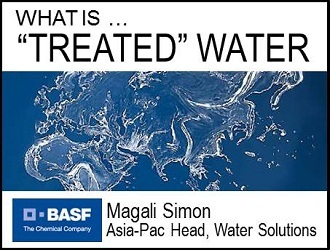 L Magali Simon Regional Head Asia Pacific, Water Solutions BASF East Asia Regional Headquarters Professional career Ms. Magali Simon joined BASF in 2003, and has held responsibility for supplier management and raw materials procurement, first at the BASF headquarters in Ludwigshafen, Germany and later BASF South East Asia, Singapore, and BASF East Asia Regional Headquarters, Hong Kong. In 2011, she became Regional Head of Water Solutions Asia Pacific at BASF East Asia Regional Headquarters in Hong Kong, providing leadership in guiding BASF’s global Water Solutions strategy in the Asia Pacific region. BASF is one of the leading suppliers in the water solutions field.